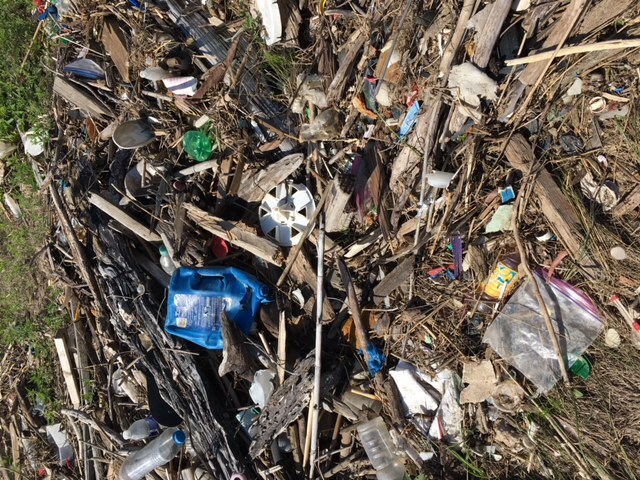 It is no secret that litter and trash debris tend to accumulate on shorelines around Galveston Bay. However, the extent of this problem and locations of debris accumulation remain largely unknown. The Galveston Bay Report Card gave “Litter and Trash” the grade of an “I” or “incomplete” to trash and debris for this very reason. Due to this, citizen reporting of pollution and a partnership-driven response is critical. On Feb. 13, 2018, representatives of Plastic Pollution Prevention (P3) Partnership met with Galveston Bay Foundation (GBF) to discuss the possible joint coordination of future cleanups. Soon, both groups were made aware of massive trash accumulation near the Lynchburg Ferry through pollution reports filed on the Galveston Bay Action Network (GBAN) app. P3 Partnership quickly began coordination with Harris County Pollution Control to coordinate a response. Meanwhile, Channel 2 and Channel 11 ran the story on the 6:00 and 10:00 pm broadcast, showing drone flight views of the mounds of plastic along the shoreline. GBF and P3 Partnership met and agreed that it was important to take action with a cleanup sooner rather than later. We selected a date to host a cleanup, developed a plan, identified the equipment needed, and ensured implementation of necessary safety precautions. It all came together because of many local partnerships; Monument Inn allowed us to use their parking lot as a staging area, Pct. 2. Harris County Road and Bridge agreed to send staff with a trailer to pick up the bagged plastic trash. GBF and P3 Partnership representatives requested fellow conservation partners to assist with the cleanup. The cleanup at the Lynchburg Ferry shoreline was executed April 11, 2018. Nature could not have cooperated any better as it was a beautiful day, tides were at their lowest, no wind, and the perfect temperature. 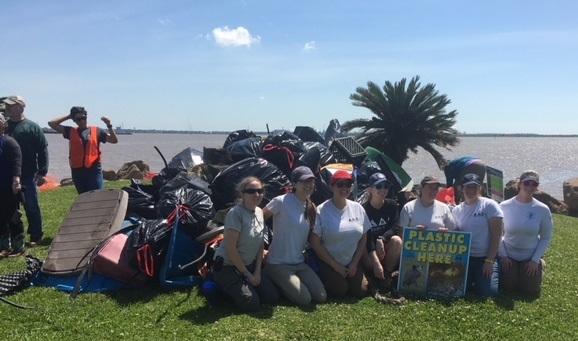 When the 29 participants arrived, we were pleased to have many organizations represented: Audubon Texas, BEACH, Galveston Bay Area Chapter – TXMN, Galveston Bay Foundation, Landry’s, Galveston Surfriders, Moody Gardens, Port Houston, and Texas Parks and Wildlife. Pct. 2, Harris County Road and Bridge added significant synergy to the mix by assisting the volunteers whenever possible and even helped to remove large debris. At the end of the cleanup we had removed 110 bags and at least 80% of the surface and near-surface floatable plastic. This was all accomplished in two and a half hours! At the end of the day, all the participants inquired when the next cleanup would take place. Even though so much had been accomplished, more cleanups are needed. Shoreline trash accumulation sites, oil spills, and non-point source pollution are caused by human choices. This pollution is made worse in our area by the fact that area rainfall events wash this debris into our bayous which feed into Galveston Bay. This trash can accumulate on shorelines like the Lynchburg Ferry site, as well as reaching the Gulf, often out of sight, out of mind. The GBF GBAN app gives every citizen the ability to easily report pollution which then provides a unique opportunity for coordinated partnerships to take cleanup actions where needed. To learn more about GBAN, visit the website to take action today. The P3 Partnership members began doing shoreline cleanup in 2015. Since then, we have seen long-term improvements at several sites, more community engagement, and positive influence overall. In addition, we have also discovered a secret few know; shoreline cleanups are a ton of fun and everyone leaves feeling empowered! Currently, there are GBAN reports of trash and debris all across our Galveston Bay system. There is much work to still be done, and we need people like you to help us tackle this monumental pollution problem. Let the cleanup coordination begin!! Cover Story, Uncategorized litter, pollution, trash. permalink.